If you're going to jam with bluegrass or country pickers, this is one you need to know. It's an easy three-chord song in the key of G, so is often one of the first gospel or bluegrass tunes new players learn. The lyrics to "Will the Circle Be Unbroken?" 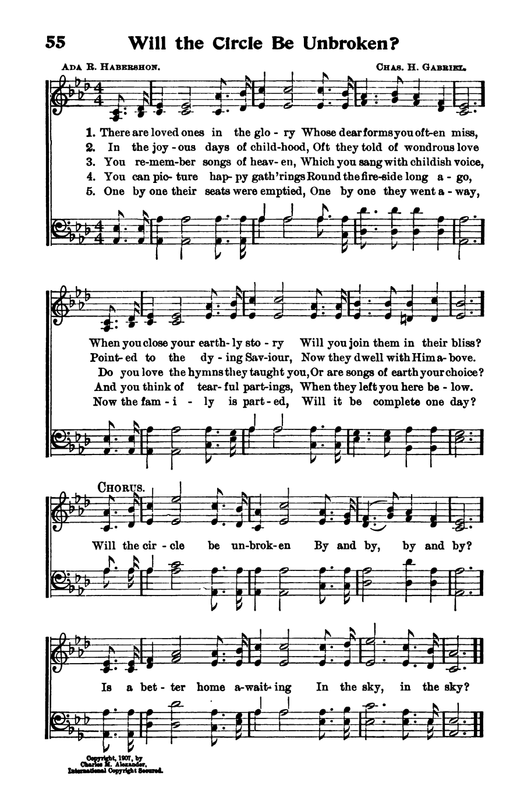 were written in 1907 by Ada Ruth Habersham with music by Charles H. Gabriel. However, the song they wrote is little known today and rarely sung. The version here, popularized by the Carter Family in the 1930s and introduced to a whole new generation in 1971 on the classic album by the Nitty Gritty Dirt Band (which brought together rock and rollers with the most traditional country and bluegrass artists, including Mother Mabelle Carter), includes none of the verses of the original, but keeps the chorus almost intact. The melody though similar to Gabriel's has also changed via the folk process. If you're interested, you can view the original hymn here. The lyrics may seem a bit maudlin for some, but the overall message of re-uniting with family and loved ones has universal appeal. Thanks to Jennifer in Corinth, Texas, for requesting this one, and for teaching me how to build the website!